Does this scenario sound familiar? You’ve invested in lead generation strategies and you have a steady stream of new leads…but your bottom line remains unchanged. These circumstances are frustrating, but not uncommon — research shows that 98% of marketing qualified leads never result in closed sales. To reverse this trend, it’s important to engage your potential customers through lead marketing. 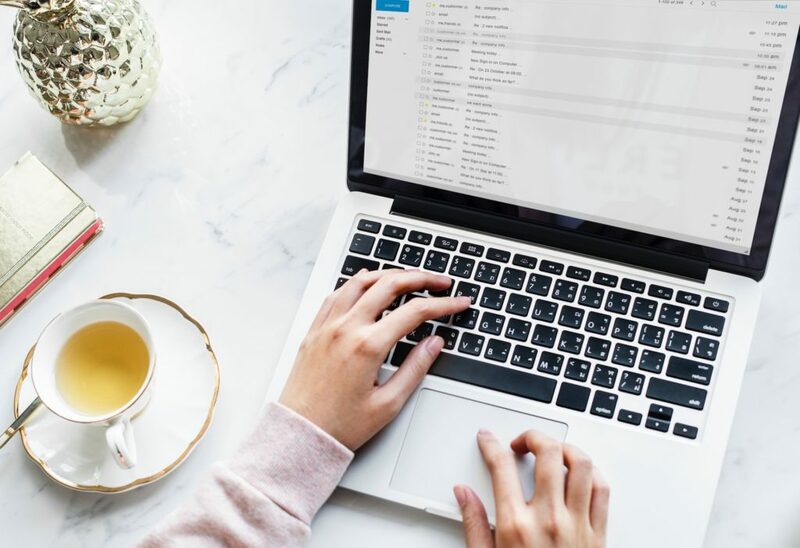 Email marketing to leads is a key part of lead management, as it provides an opportunity to educate and nurture prospects as they move through the buying process. Regular communication also ensures that your business is top of mind when a lead is ready to make a purchase. First things first — lead marketing campaigns don’t have to be strictly promotional. In fact, when you have newly-acquired leads, bombarding them with “BUY NOW” messaging may turn them off from purchasing from you. Instead, try sending a helpful email that educates on a topic or teaches a skill relevant to your business. Your leads will appreciate receiving valuable content for free, and you’ll position your product or service in their minds as a potential solution to a problem. 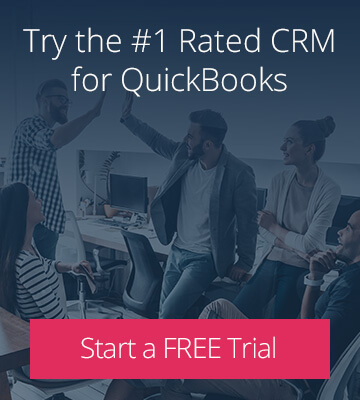 In the sample email shown here, Framebridge encourages their leads to click through for helpful content, rather than directly advertising their services. The guide to hanging wall art certainly complements the custom framing offered by the company. However, this resource could still be useful to recipients regardless of whether they want to place an order. Method:CRM users: In addition to Method’s Email Campaigns features, you can also take advantage of Method’s free integration with MailChimp. Often, you may have leads who are intrigued by your offerings, but still have concerns that are holding them back from buying. Don’t wait for these leads to come to you! Compile a list of frequently asked questions about your product or service, along with clear and concise answers. For example, a tutoring company could prepare a list of FAQ’s about rates, subjects, and tutor qualifications. Sending this information directly to your leads will convey that your company is proactive and intuitive. And with any luck, your leads will gain peace of mind that your product or service is right for them. 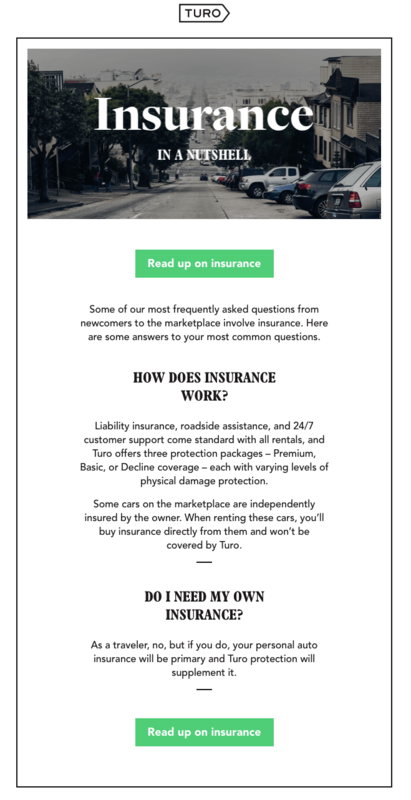 The sample email below is from Turo, an app that enables people to rent cars from local car owners. Customers frequently ask about insurance on the rental cars, so the company has made sure that this info is available to prospective users of the service. Method:CRM users: When you write a lead marketing email that you want to use again, save it as a custom email template in Method. Of course, you want to inform your existing customers when you introduce a new product or service. However, it’s also beneficial to share the good news with your leads. For some leads, the new offering may be the missing piece that was holding them back from purchasing. Providing a brief overview of the new features available is a great way to capture a lead’s interest and encourage them to learn more. For example, in the case of a tutoring company that has expanded their subject offerings, they could send an announcement to leads that have expressed interest in certain subjects. In the sample email shown here, it’s clear that Sprout Social is announcing a new feature called the Facebook Pages Report. Take note of how the message encourages leads in their trial period to log into their accounts. This ensures that leads can assess the new feature before deciding whether to subscribe to the platform. Method:CRM users: Use tags to categorize leads based on characteristics relevant to your industry. You can then create a segmented lead marketing campaign by using advanced search to filter leads by tags. If you’re not yet using email marketing to engage with your leads, why not try one of these campaigns? 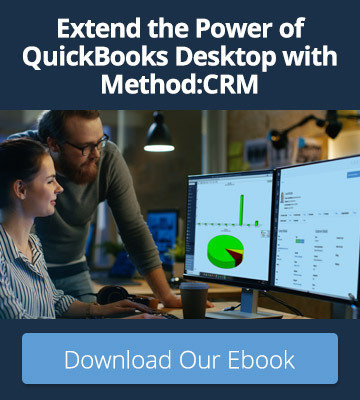 Method:CRM provides plenty of options for lead marketing, with built-in email campaigns as well as a free MailChimp integration. Sign up for a free 30-day trial today!